Buyers Choice Home Loan Advisory was founded in Melbourne in 1995 and now has operations in all Australian states. Managing Director Mick McClure has been in the industry for 24 years. During that time, he has seen Mortgage Broker market share rise from 5% of all mortgage finance to 60% as at January 2019. Mick and his management team required sound advice to restructure the firm’s Professional Indemnity insurance to reflect the changes he is bringing about in the business. “Complying with our changing PI compliance requirements meant creating a different certification structure. Not only have our PI cover arrangements become more complex – maintaining this on an ongoing basis will be more onerous,” he says. His national team of 170 brokers is currently licenced via their head aggregator group. In late 2018, his business decided to restructure operations, obtaining an Australian Credit Licence for Buyers Choice and commencing a transition of members to the new “in house” licence structure during 2019.
achieve their home ownership dreams.". As an Insurance House client since 2006, he turned to his Key Account Relationship and Development Manager, Robyn Styles. She came to his Scoresby headquarters to understand exactly what he wanted to achieve. “It seemed complicated to us, but Robyn was all over it – like Vegemite over toast,” Mike says. “She came up with a plan that enables us to manage our own PI requirements easily. The Professional Indemnity insurance solution Insurance House created for Buyers Choice minimises the impact of managing the new compliance burden. With some minor changes to its processes, brokers can be added (or deleted) from the PI certificate quickly and easily. With a new policy in place, Buyers Choice is ready for change. “As we start appointing credit representatives, we can trigger the new process to ensure we’re meeting both our and their statutory requirements, ” Mike says. 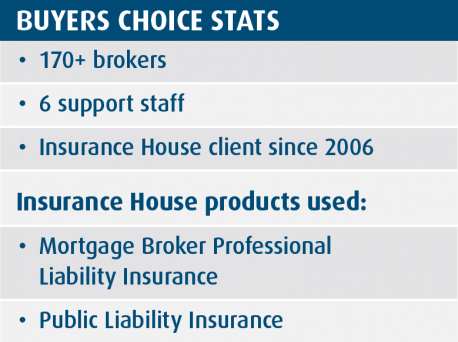 Over the coming months, Buyers Choice will be relying on the Insurance House Customer Support Team to relieve it of administrative burden, helping it achieve its business goals. “It’s an ideal solution for our business,” Mike says. Want to read about how we have helped others?